Paradise! Isn't that just the perfect wedding scenario? Well, you have found paradise. 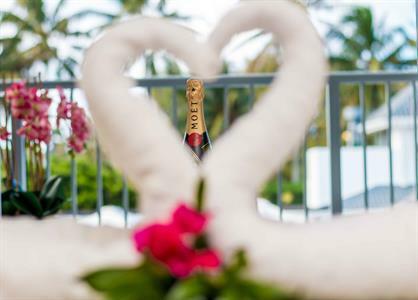 A wedding and honeymoon at Muri Beach Club Hotel gives you all that and so much more. Do not worry about all the arrangements, your personal wedding coordinator will do all that for you. How much time and worry does that save you? We organize your wedding licence (and this is legally recognized in most countries). We can also organize a local celebrant, a minister, pastor or a priest. We also provide witnesses if required. Celebrate your wedding with the sand between your toes, a cool, sparkling champagne in your hand and the heady aroma wafting around you from your tropical flower garlands. If you fancy a romantic dinner on the beach we can do that too. Contact us now for more details. Below is a list of the wonderful packages we have put together, just for you. These can be adapted to suit your special requirements. Although Muri Beach Club Hotel is an adults only property, we welcome children on-site when celebrating special occasions, such as our wedding ceremonies and receptions, however prior notice is required. Celebrate your special day with 30 of your closest friends and family catered for. The complete package - your beautiful ceremony under a floral archway in our exclusive beachfront locations, reception in a choice of 3 venues, Polynesian Buffet feast, 3 hour drinks package, 1 tier wedding cake, plus a 5 night stay in a Deluxe Beachfront Room for the Bride and Groom based on terms & conditions. The perfect choice if you are looking for a low-key, intimate wedding and great value for money if you are on a budget. You get everything you need to become man and wife, and everything is done for you. Just arrive, laze on the beach and await your date with destiny to arrive. No fuss, no stress, just pure privacy and enjoyment! 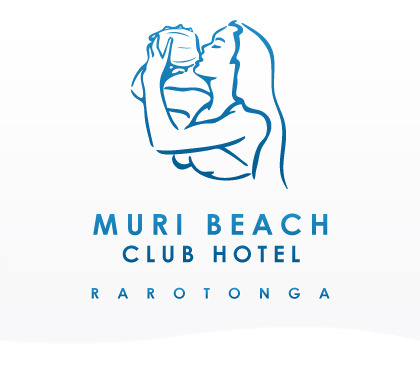 Wedding groups receive 15% discount on our Muri Beach Club Hotel Spa services! Enjoy a pre-wedding day girls pamper session, or a romantic couples massage for the new Mr & Mrs! We can also arrange catering such as canapés and cocktails for your day of relaxation. Must be pre-booked so email us to make your booking. How do I secure my date? What days of the week are best to book my wedding? In order to secure your date, we require a $1000 non-refundable deposit. Simply email your enquiry to operations@muribeachclubhotel.com and our Wedding Planner will advise you of our availability. They will then send through either a credit card authorisation form or our bank account details, whichever payment type your prefer. Please note that some bank fees may apply. Yes, children are welcome to attend your wedding. Unfortunately, as we are an Adults Only hotel, children may not stay at the Hotel over night. The day prior to your wedding we will send out a letter to all guests notifying them that children will be on site. It is beautiful on the island all year round, with very little variance in temperature. Being a tropical island, there is always a slight chance of rain. Your wedding planner will work with you closely, depending on what time of the year you choose, and will suggest certain ceremony times dependent on the time of sunset as well as the hottest parts of the day. Do you have wet weather options? We have wet weather options, should the weather be unfavourable. We have our air conditioned Lagoon Lounge. This can be turned into a nice space for a ceremony, as it has a magnificent view of the lagoon on one side and our bright blue pool and mountains on the other. Do you provide the celebrant? Yes, we have a number of celebrants available whom we will be able to recommend depending on what style of ceremony you would prefer. We can also arrange for a Catholic or Christian Minister. Can I bring my own celebrant? You are welcome to bring your own celebrant, however, by law there must be a local officiating minister present to witness the ceremony as well as sign your official documents. What isn't included in the wedding package? Our ‘All Inclusive’ package pretty much has you covered. Some things to consider are outside services such as photography, make up, hair and flowers. We have an excellent standard of suppliers here on the island, and your Wedding Planner will be able to facilitate all of these requirements on your behalf. Are you able to organise a hen's or stag's do? We often organise these occasions for our Guests; whether it be a buggy tour, fishing charter or pamper day in our spa. Some of these services are offered by outside companies, however we can organise everything for you so that you can simply relax. What decorations and items are included in the reception/venue hire? It is $1,500 for our venue hire if you do not choose our ‘All Inclusive’ package. This cost covers tables, chairs, covers, sashes, draping, fairy lights, cutlery, crockery, glassware, cake table and music table. We have glass fish bowls that can be used for centre pieces on your tables. You are welcome to bring your own decorations or alternatively, we can organise floral arrangements for you at a cost. What is included in the ceremony, in terms of set up/decor? For the ‘Club Classic’ and the ‘All Inclusive’ package, you will receive a floral archway, draping (if you wish), decorated registry table and chairs. This is only at the discretion of the General Manager as we are a licensed premise. A corkage fee of $20 per bottle will apply for wine and champagne only. No other alcohol or non alcoholic beverage is to be brought on to the premises. What flowers are available on the island? The main tropical flowers available are frangipani, gardenia, anthurium, gingers, and chrysanthemum. While hibiscus is available, they are not recommended as they do not last the day. What are your cake options? And decorations? Our specialised cake makers can create a variety of flavours and styles for you. You may choose from a 1, 2 or 3 tier cake. Cupcakes are available, and can be placed on a decorative stand. All cakes come with a floral cake topper to match your bouquets and ribbon to match your colour scheme. And again, you are welcome to bring your own cake topper from home. What makeup do your makeup artists use? We have a number of makeup artists that we use; the majority of them use MAC makeup, and also other make up products. Who is in charge of set up and pack down? Our wedding and restaurant team are responsible for all of the set up and pack down tasks. On occasion, should there be quite a number of delicate decorations, the bridal party and/or helpers will be asked to assist. There are a wide range of choices on the island from fire dancers to DJ's to local artists and string bands. We also have an IPod Dock or PA System available for hire. The PA System comes complete with two portable microphones that can be used for speeches. Will my wedding planner be there the whole time? Your wedding planner will be right there with you throughout your ceremony and your reception. Your wedding planner will take you to the Registrar of Marriages and to all your wedding related appointments in the days leading up to the wedding. Can I bring my own wedding favours and decorations? Absolutely, it is often suggested to send through any photo's you find along the way of things you like. This ensures that your wedding planner has a very clear image of what you are trying to achieve. We will do our very best to source items/decorations here on the island. And on occasion, you will be encouraged to bring things from your home country as we are an island and as a consequence, our supplies can run low. *Wedding favours are small gifts placed at each guest setting. Such as chocolates, lollies, fans etc. What is the maximum number of guests I can have? Our Lagoon Lounge holds 80 guests, the Beachfront Marquee holds 60-70 comfortably and our SilverSands Restaurant holds 120 guests. In the event that your numbers exceed these numbers, there will be an additional cost for items such as an additional marquee. What time must the music be turned off? All music must be turned down at 10.30pm and off at 11:00pm. This is done in consideration of our other hotel Guests, who may not be attending the wedding. 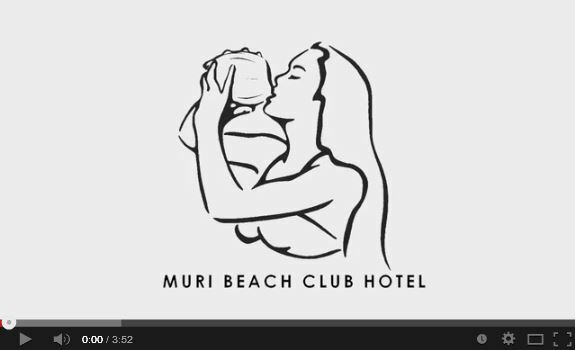 Why choose Muri Beach Club Hotel for your wedding? Here at Muri Beach Club Hotel, we pride ourselves on going the extra mile for our Guests. Being a smaller hotel, it is our mission to ensure we are personable, adaptable and present for all of our Guests. We have a full time, dedicated wedding coordinator who will be with you every step of the way. Your Wedding Planner will be flexible and will work tirelessly to create the special day that you have always dreamed of. Are you travelling on your Honeymoon? Have we got an amazing deal for you and absolutely FREE*!! *Conditions apply: proof of marriage (within the past 6 months) will be required at check in and a minimum of 7 paid nights stay in your preferred room category apply.